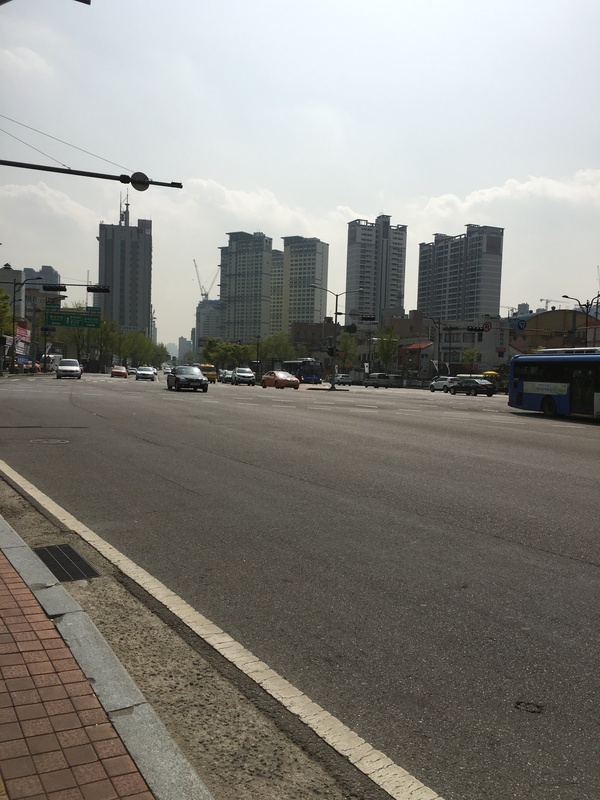 Seoul is a vibrant city…busy day and night. I’ve heard it described as a city that never sleeps. 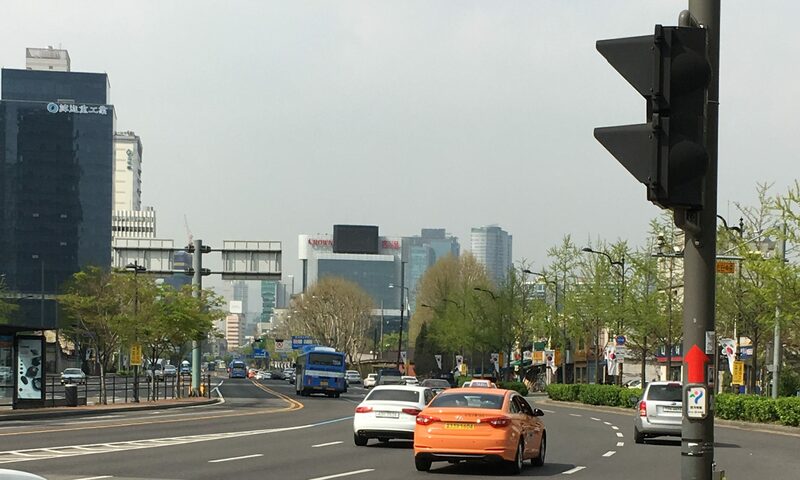 Buildings are big and modern, The main streets are wide and the subway system is jam packed most of the time. Side streets can be packed with small restaurants, shops and people….lots of people. But it wasn’t always this way. 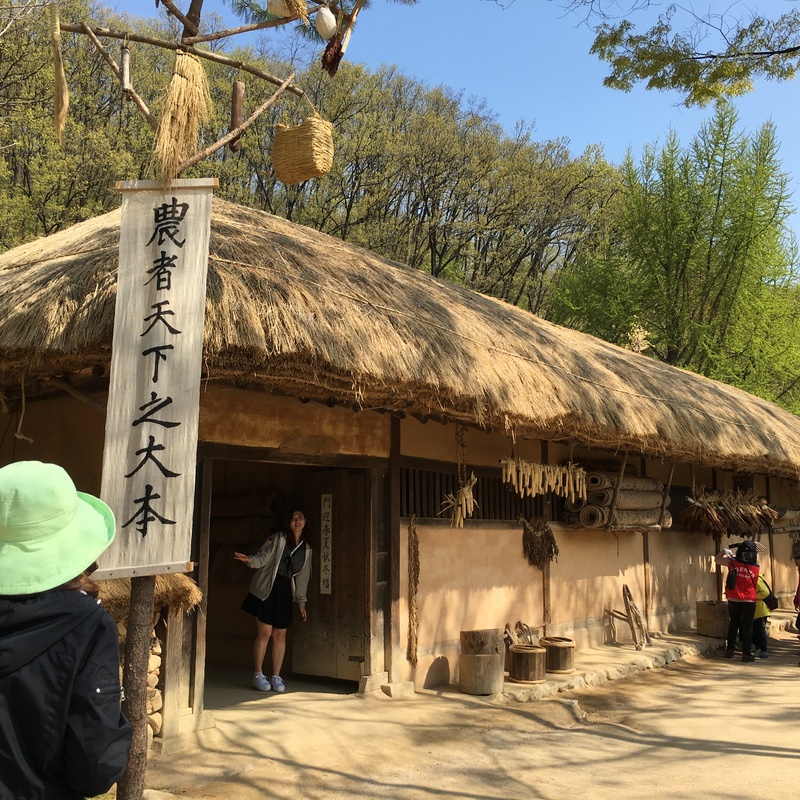 If you want to see how the Korean people lived and worked hundreds of years ago, it’s worth the trip to Minok Village, a traditional Korean Folk Village….a living museum of history. 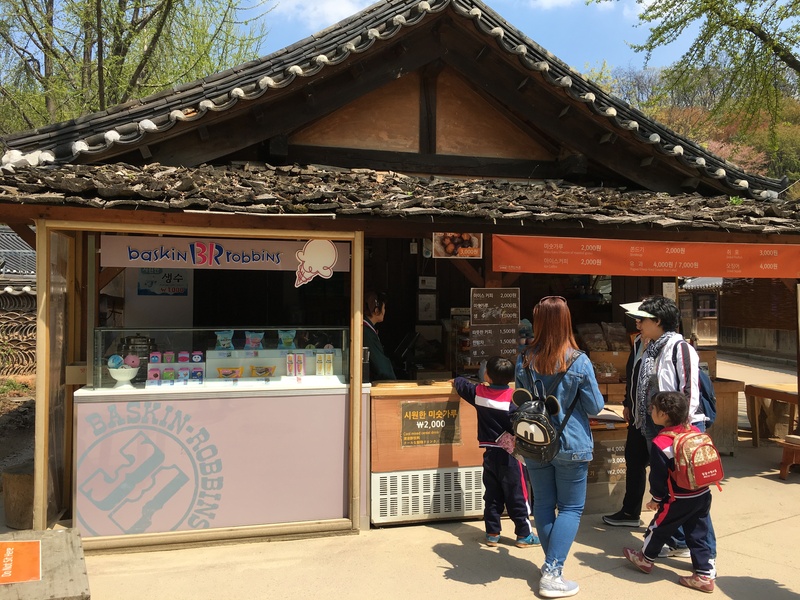 It’s located in Yongin, about an hour’s drive outside of the “downtown” area of Seoul. 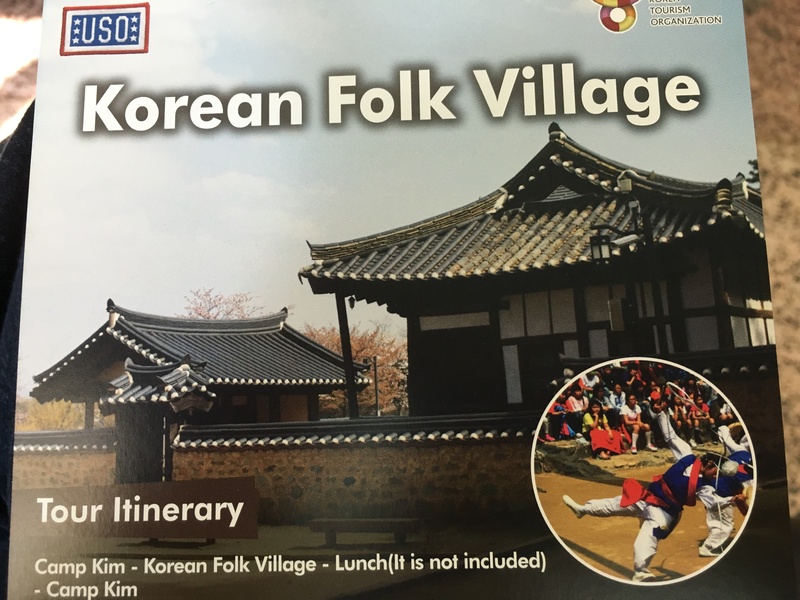 I didn’t drive there….I took another USO Tour. There were 11 people on this tour, but for some reason, the other 9 just wanted to wander around by themselves. 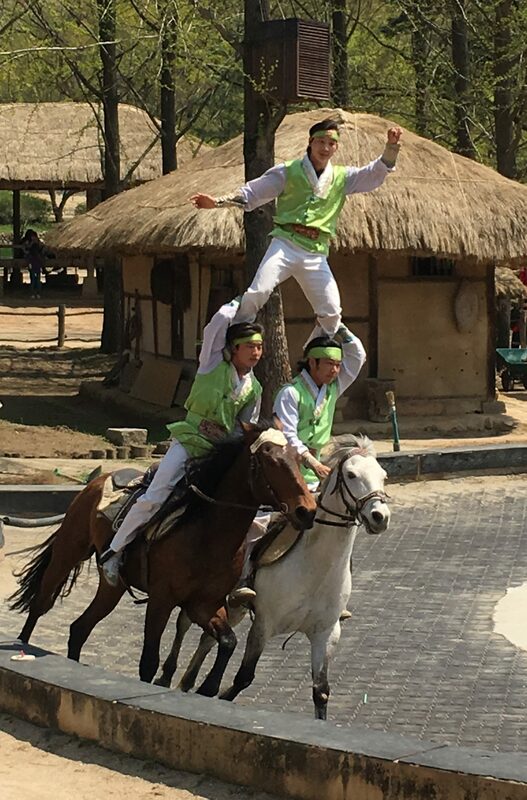 As soon as we arrived they asked the tour guide what time to meet for the ride back. They could have taken a taxi for less than the cost of the tour. Crazypeople. Anyway, that left just me and Alice, the wife of a foreign diplomat, who was getting ready to move back to the Utah. We became fast friends and good thing too because her camera battery died and I ended up taking all kinds of pictures for her. Which wasn’t a problem at all since I am “camera happy” when I’m touring around. And it might explain why this might be a long, picture happy post. So let’s get started! 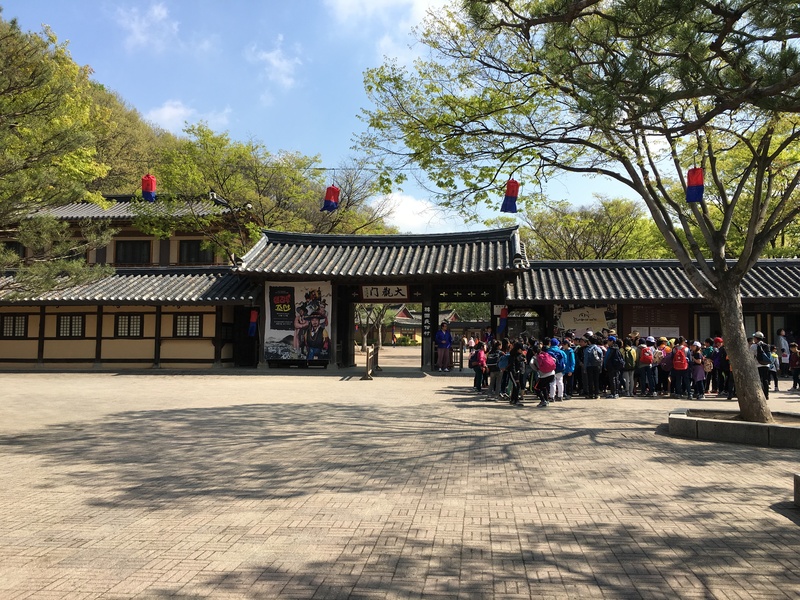 This is the main entrance to the living museum. On the other side is the Market Square (places you can buy trinkets and souvenirs of your visit). On the other side of the Market Square is the gate to the village. 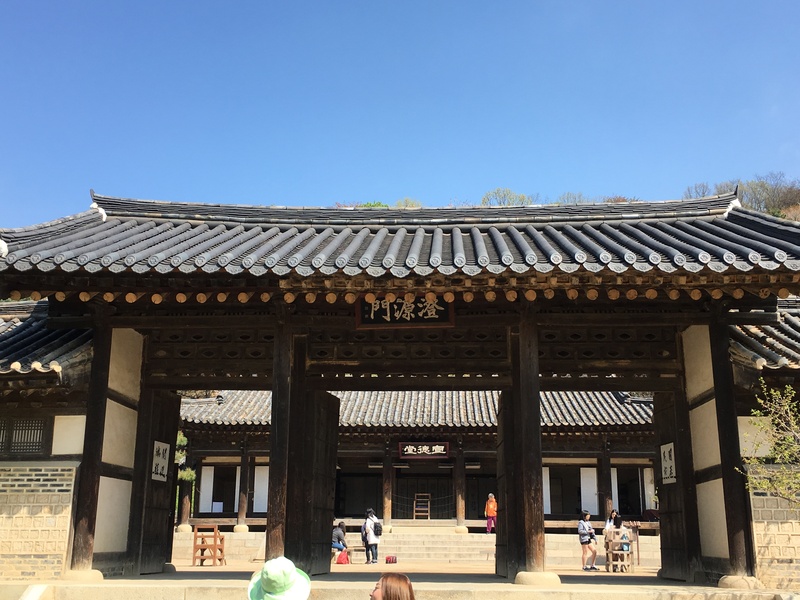 If you were of “high class”, you enter through the wider center doorway, if you were just a peon, you entered through one of the side doorways. I’m a peon. I walked through the side. 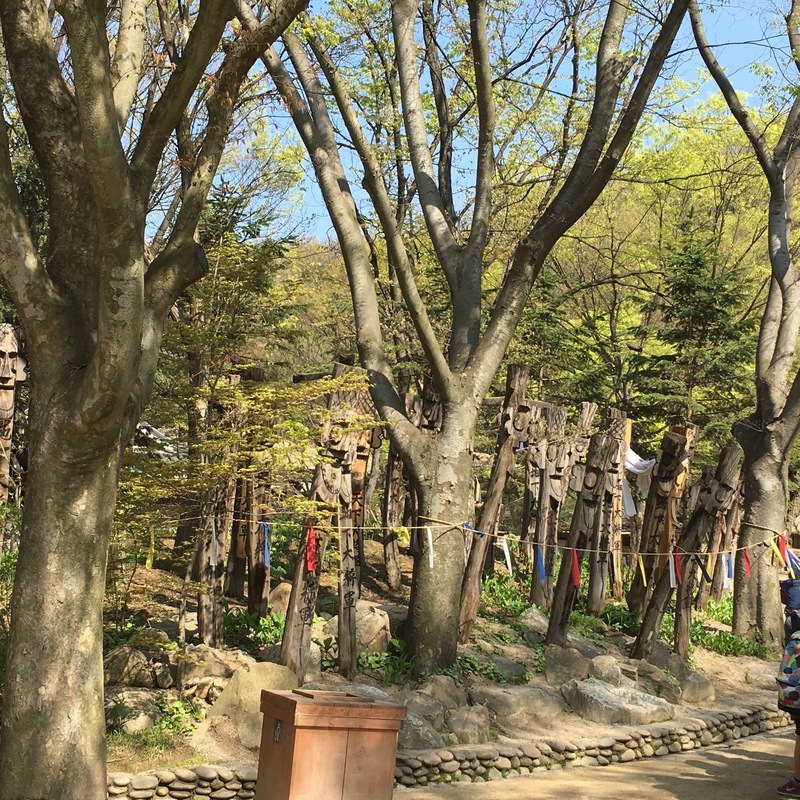 Just inside the entrance and almost hidden in the trees are these Korean Totem Poles or Jangseung. 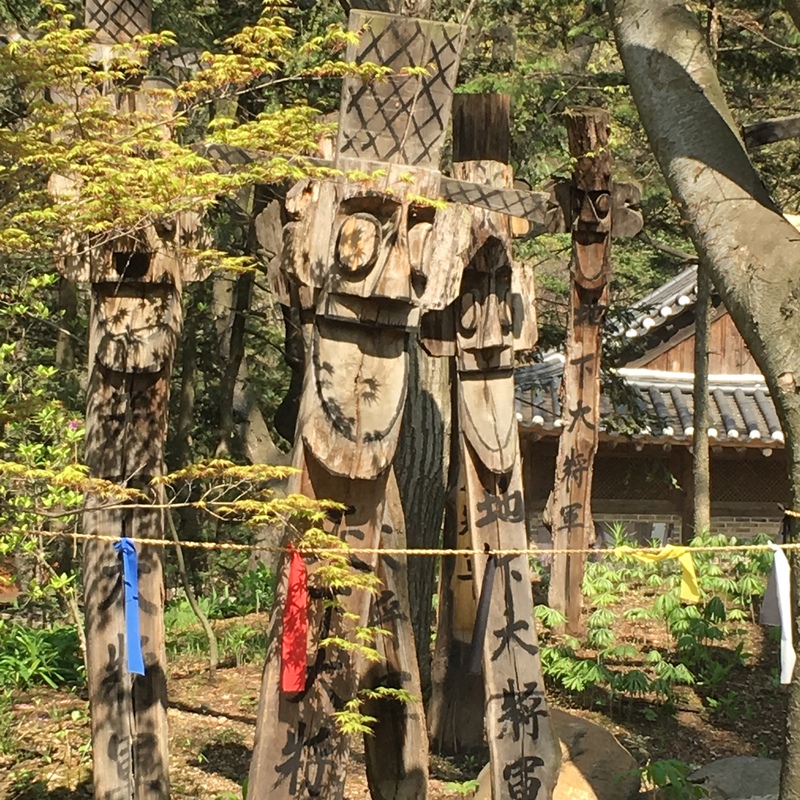 Jangseung were erected at the entrance of most every village to serve as a “village guardian” to the people living there. It was believed that they could scare away evil spirits that could cause harm, like epidemics, flood, or famine. Villagers would also pray before them asking for health, good crops, or for wishes for their families. 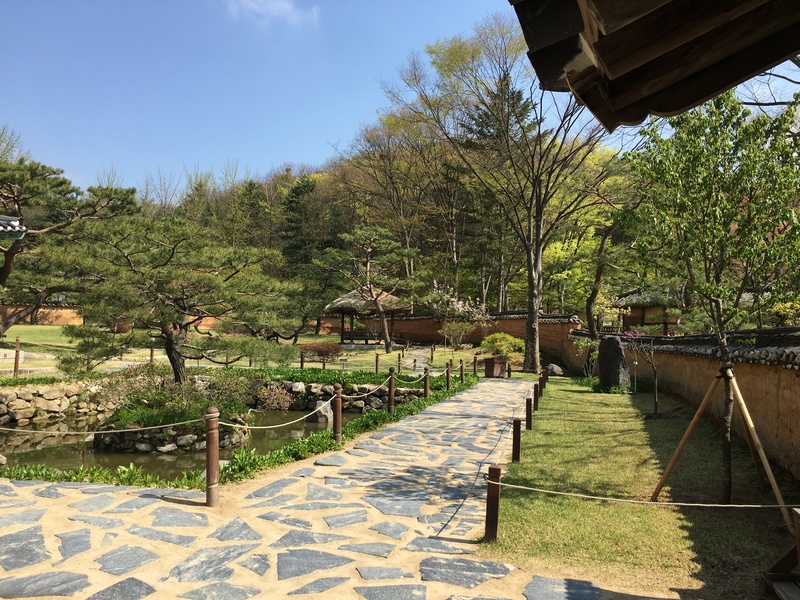 The village is about 25 acres and the houses are actual homes that were moved here from all across Korea – so you’ll notice that not all the housing styles are the same as they were built for different regions and weather. 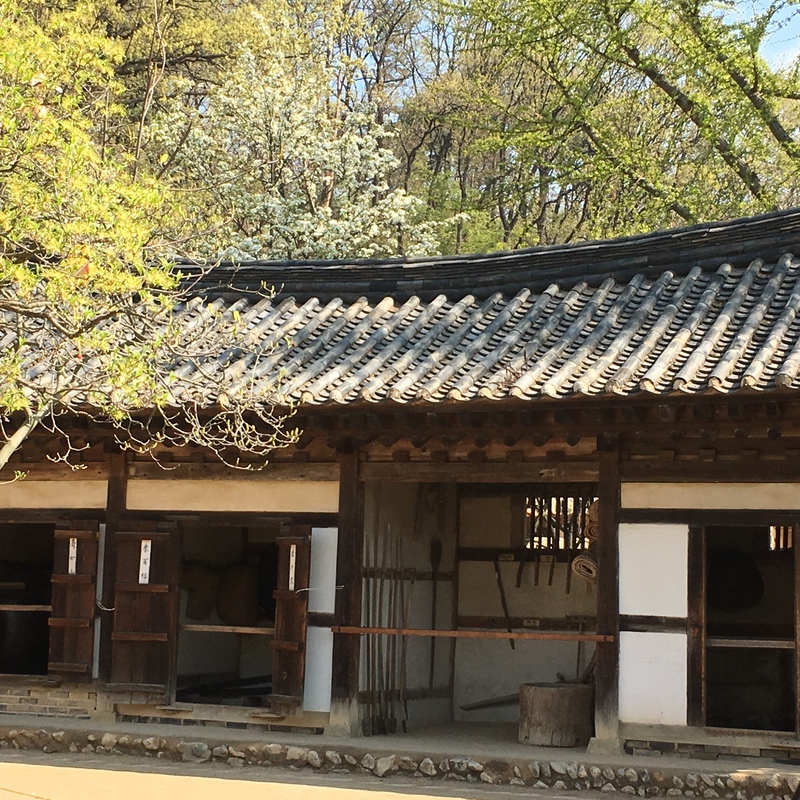 Because the homes were divided into male and female quarters to separate the sexes, many of the homes are clusters of small buildings built close together. 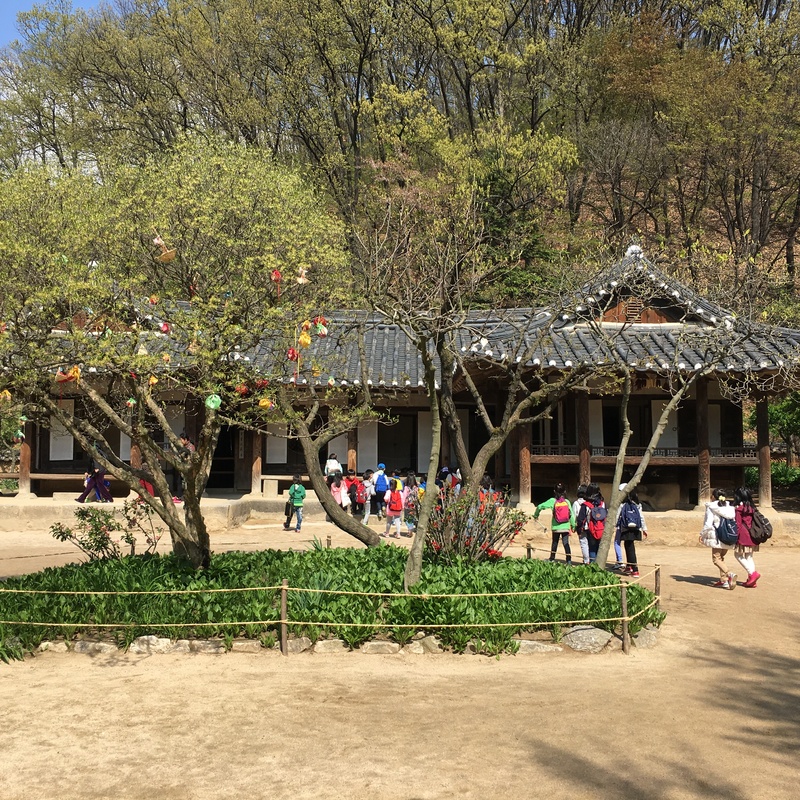 Notice the tree in the courtyard in the picture below. Hanging on the tree are colourful small wish bags that are filled with coins, small gifts or written wishes. 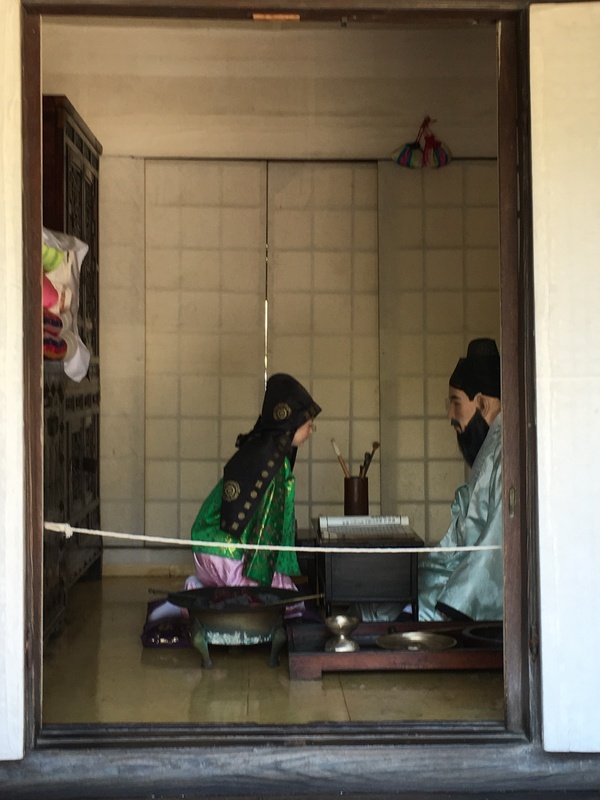 Children lived with the females, but at the age of 10 boys were taken away from their mother to live with the men so they could be educated and trained. 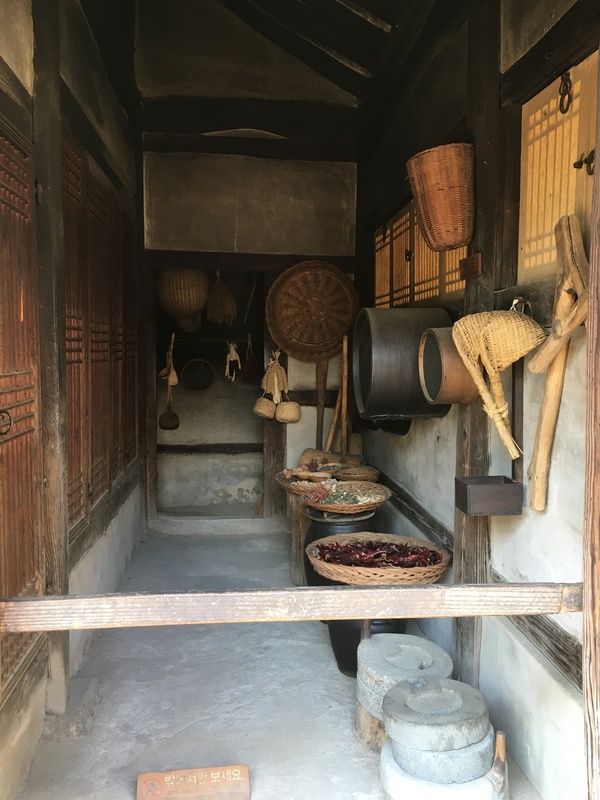 Below is a house of a farmer from the southern warmer region. 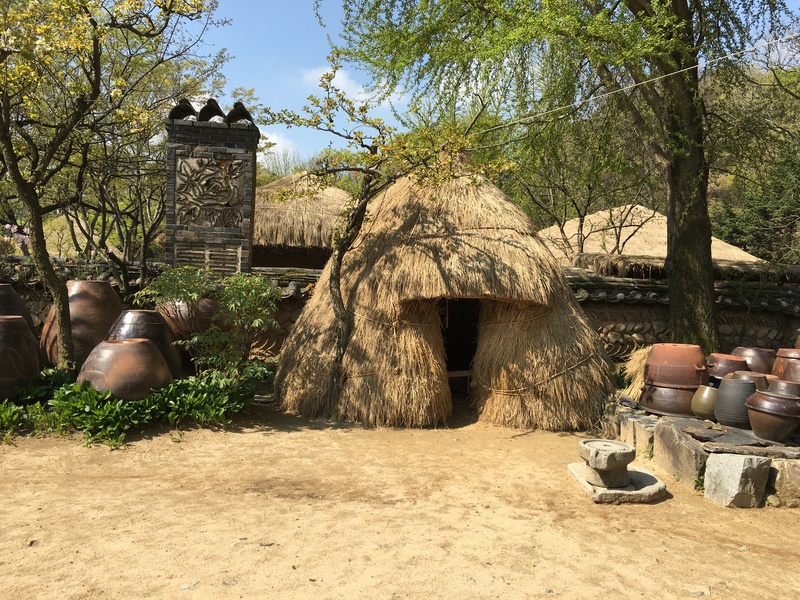 Notice that this roof is made of thatch. 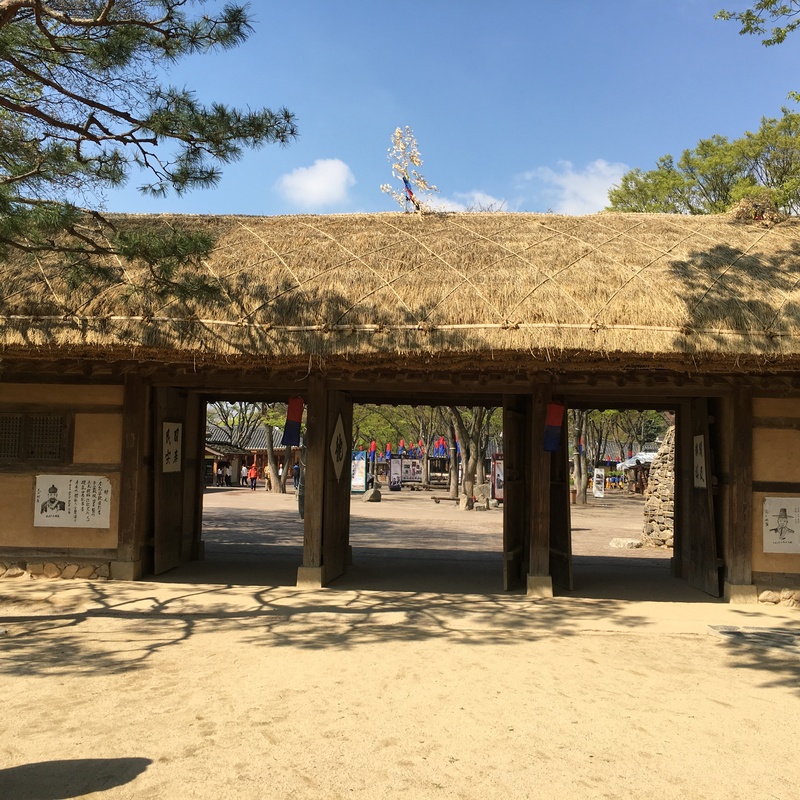 A thatched roof house is called a Choga-jib. 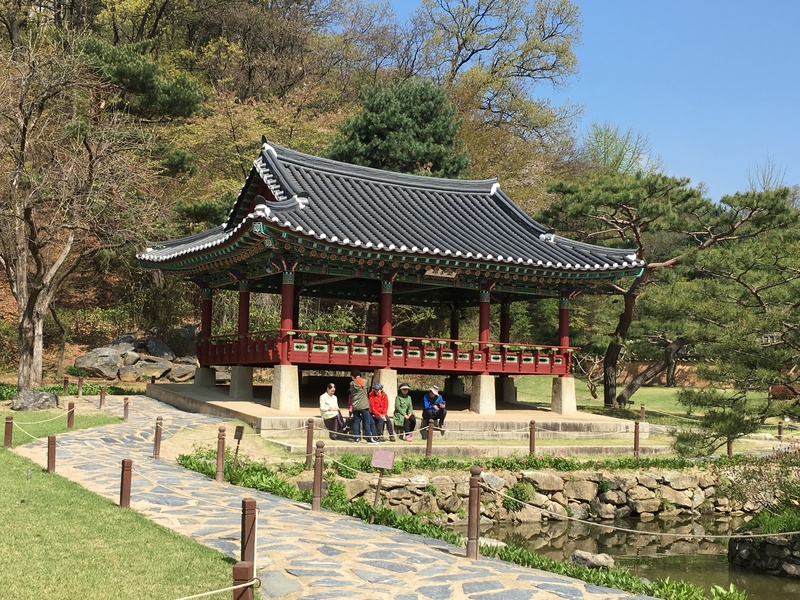 One of the best known dishes in Korea is kimchi-a spicy vegetable dish made with cabbage & vegetables, usually fermented. 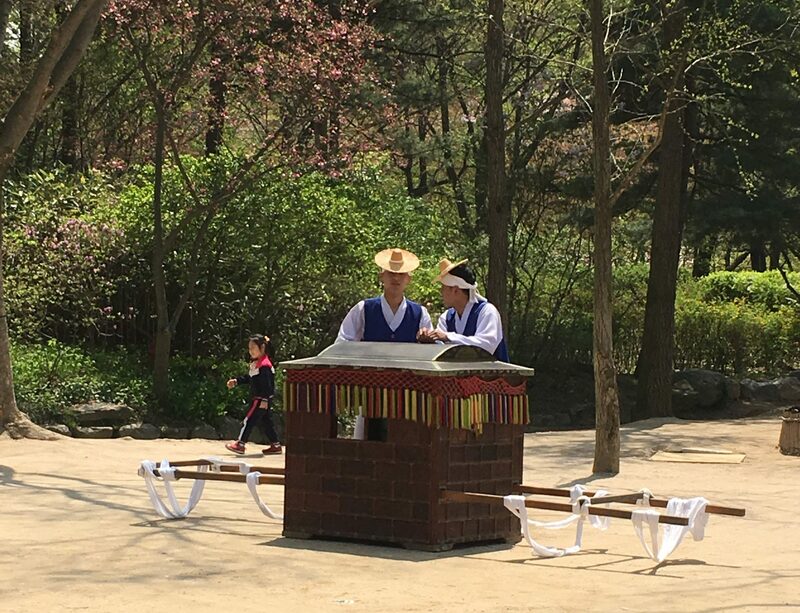 This is a kimchi hut – a special place to make this very “smelly” dish. All the pottery are kimchi pots. Yes, they make ALOT! 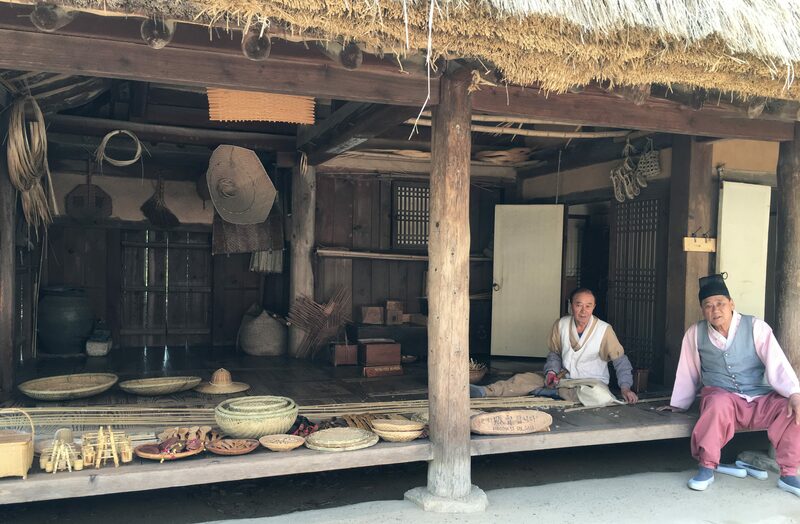 Scattered throughout the Village are workshop buildings were you can learn about the different trades, like silk weaving, wood working and basket making. 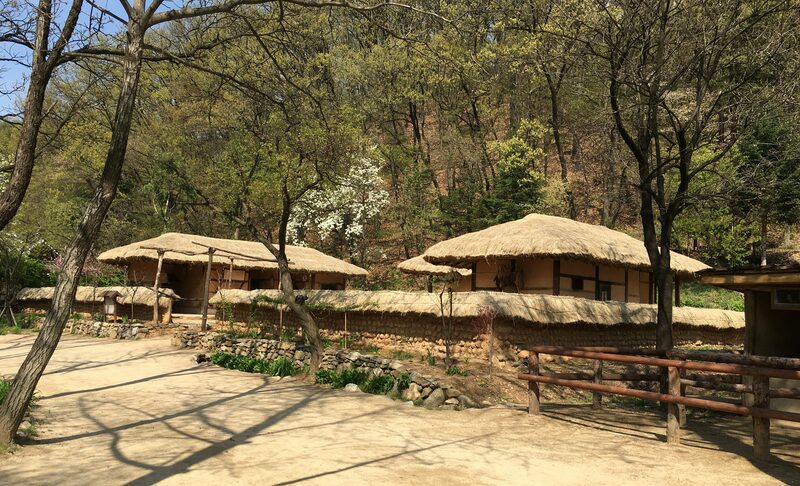 Walking further into the village is this: WanHyangRoo…a peaceful retreat. A place to come to relax and enjoy the warm breezes and garden. You might need to remember this place as the next stop in the village is the Local Government Office, it is listed on the information brochure. In parentheses is says “The Implementation of Punishment Experience”. I laughed when I read that in the information brochure….because dealing with government can seem like a “punishing experience”. 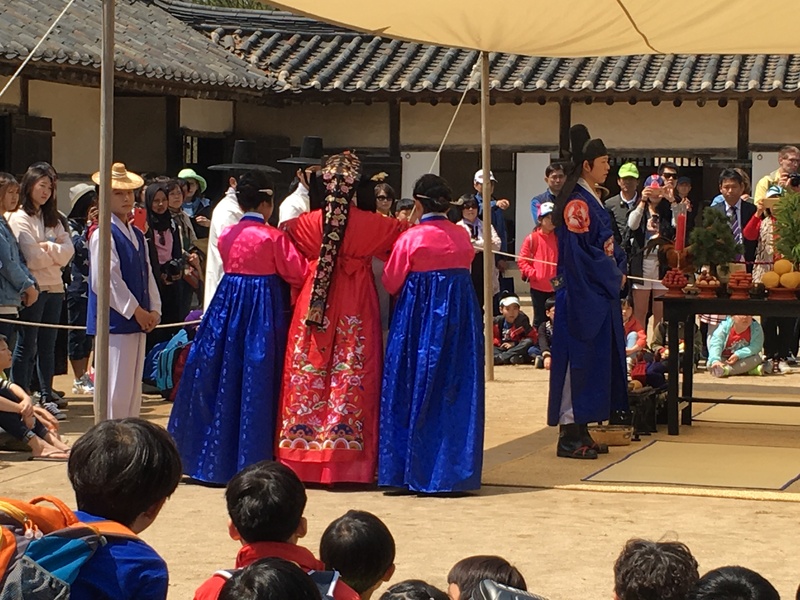 But this is actual physical punishment…doled out and overseen by the village leaders (See the chair far back in the middle?). n Two examples of punishment are this chair or this board where the person being punished lies face down outstretched. 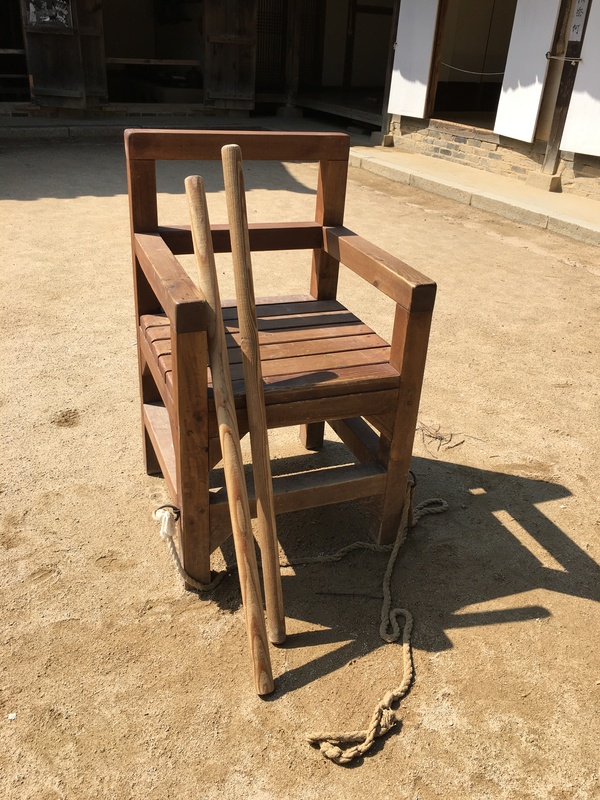 In both cases the person being punished is beaten with wooden rods, canes, chains or paddles boards. 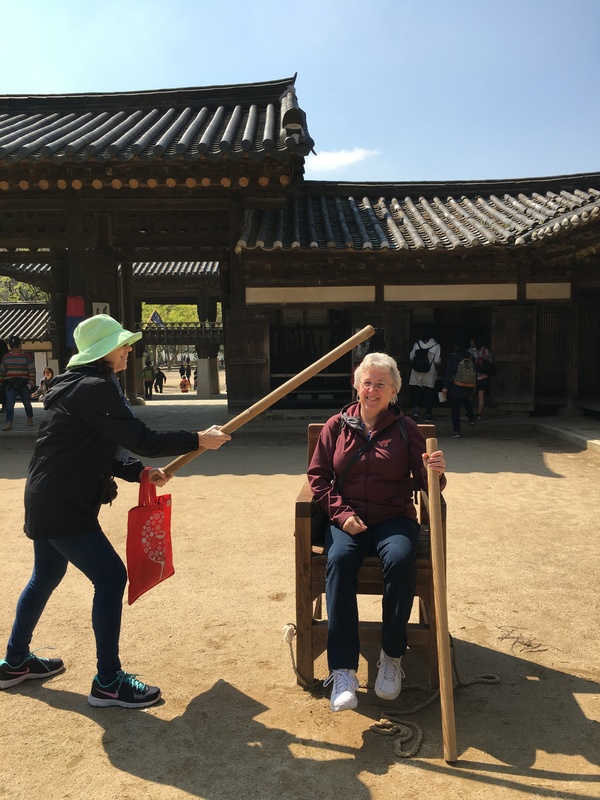 Alice decided that I needed to be punished…if it was real, I would not be smiling! 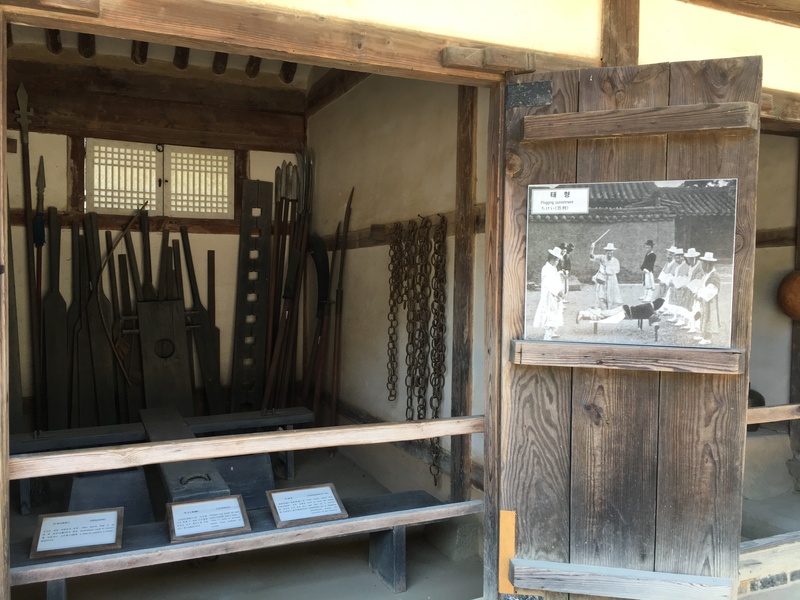 These are the weapons that were used for torture or corporal punishment. Lets move on to something more fun. Besides the home and trade displays there are also several shows/demonstrations scheduled throughout the day . 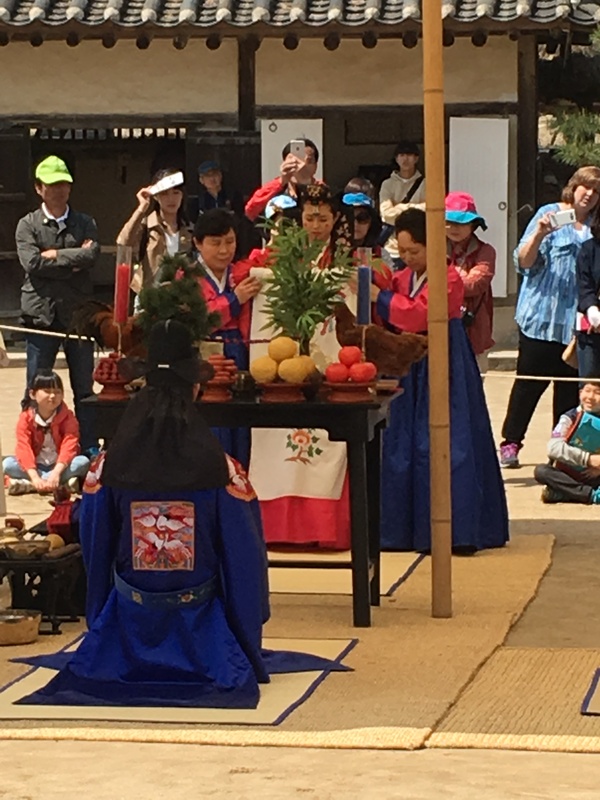 The first one was a traditional harvest celebration called a Nongak or The Farmer’s Dance, which was performed during the planting and harvesting season to give encouragement to the farmers. 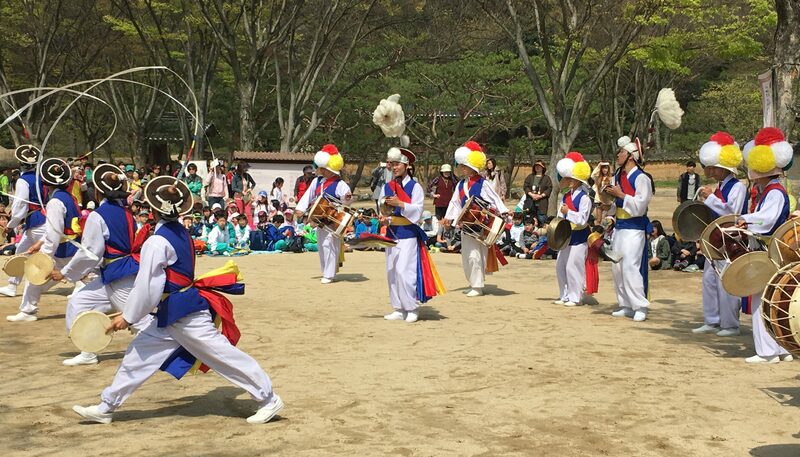 The beat of the drum also acted as a “pace-setter” for doing work. The faster the beat, the faster they worked. 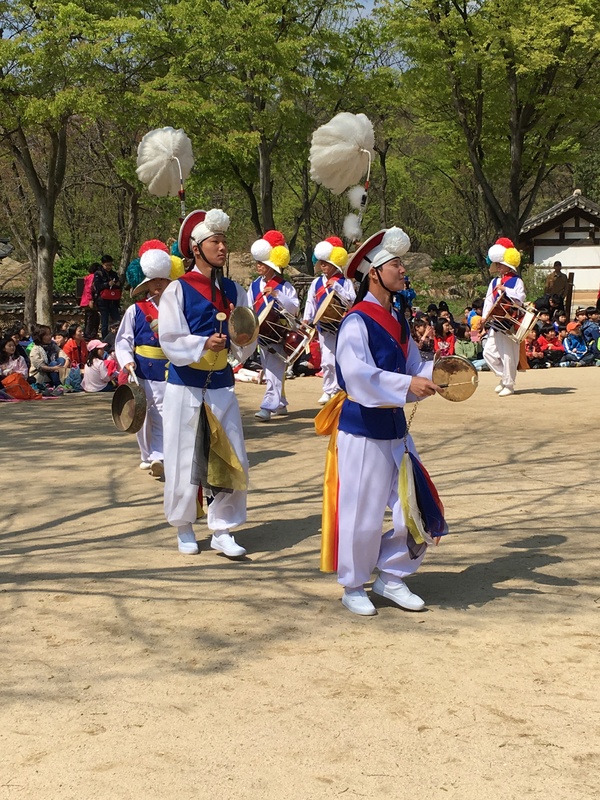 Lots of drum beating, chanting and precision moving in line and circles while playing instruments and letting the ribbons on their hats “dance”. 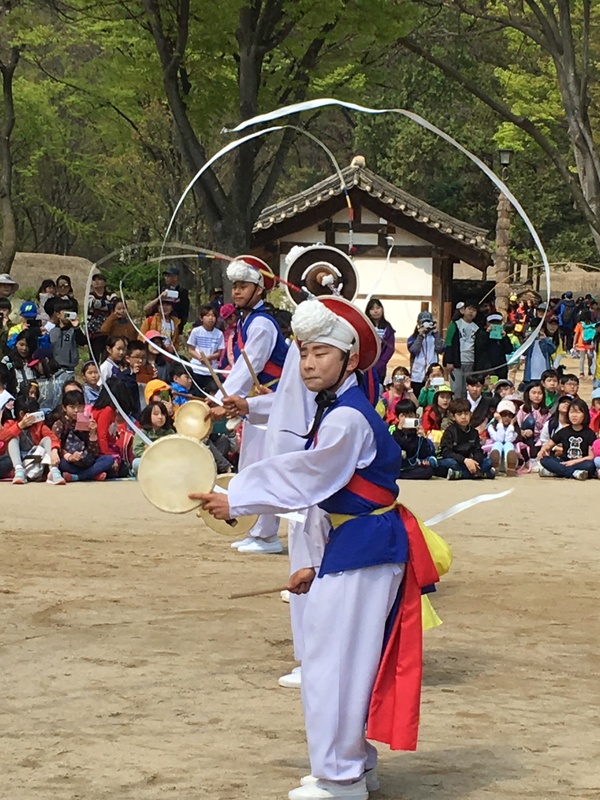 The ribbons are attached to their hats and with quick movements of their head that are barely noticeable, the ribbons “dance” in circles over their heads. 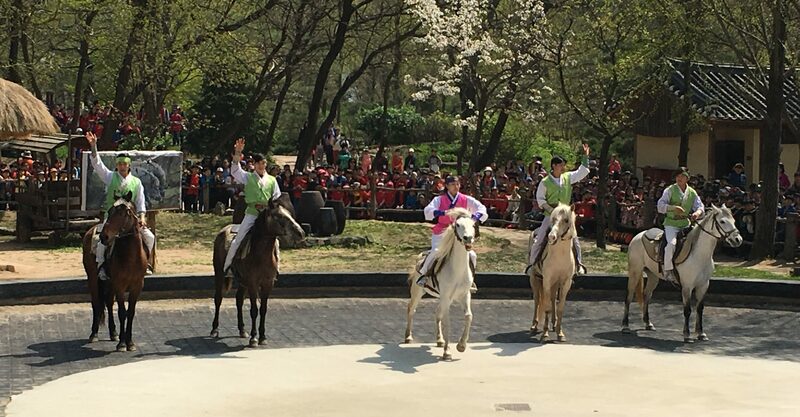 The second performance is called the Masangiae. 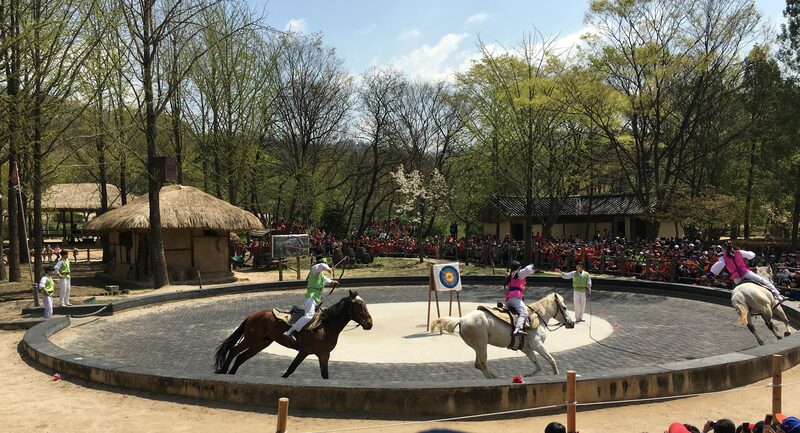 Its martial arts on horseback that involved, whips, target shooting and some circus-like acrobatics. 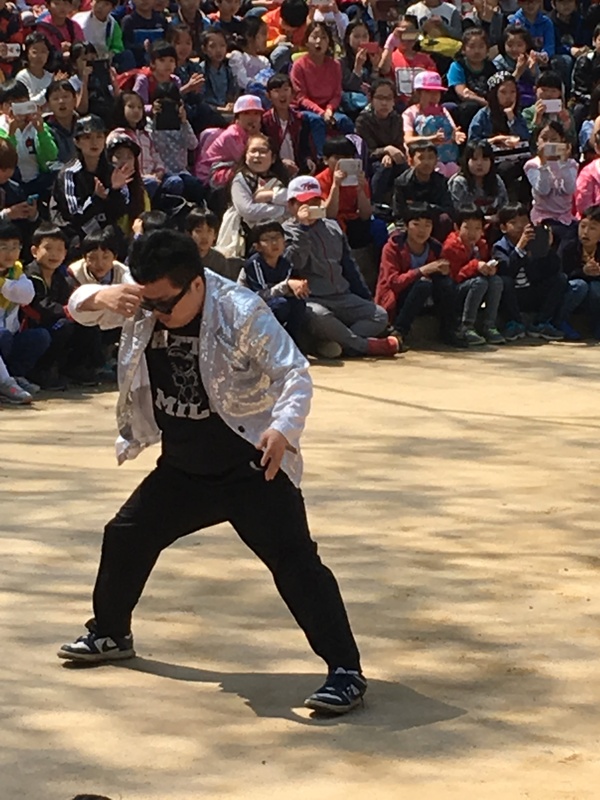 The next performance was what they call “Fusion B-Boy Dance. 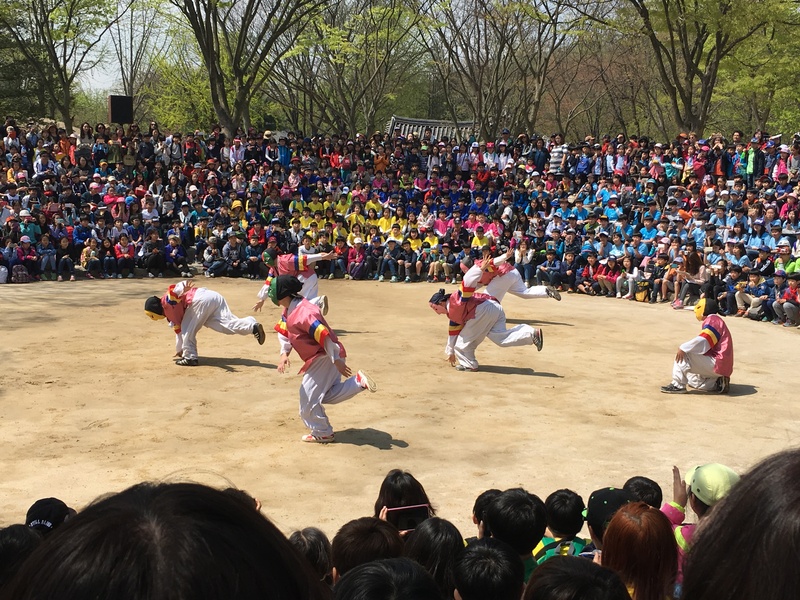 It is s a really strange mix of what they call b-boying performed to traditional Korean music. I had to look up b-boying – it’s apparently a mixture of martial arts moves, hip-hop and break dancing all combined into one. 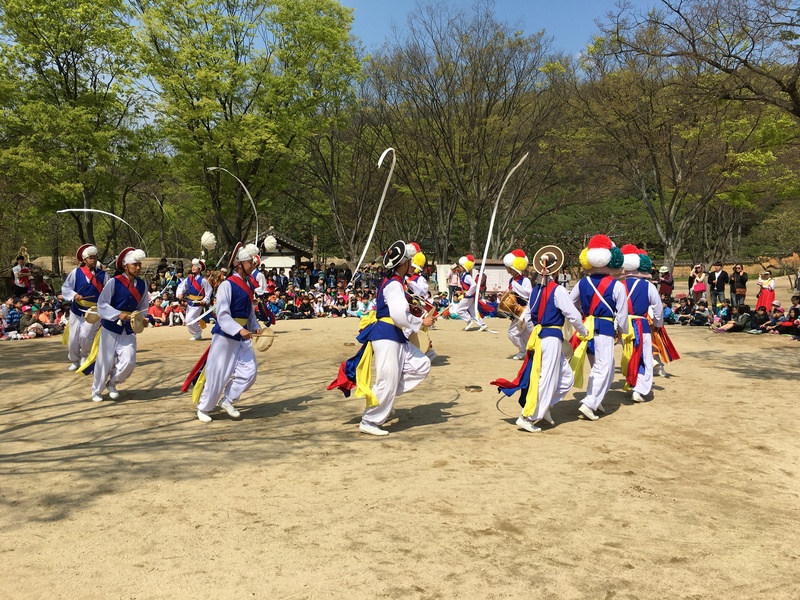 And for lots of fun entertainment, they also included a special “Gangmun” dance. 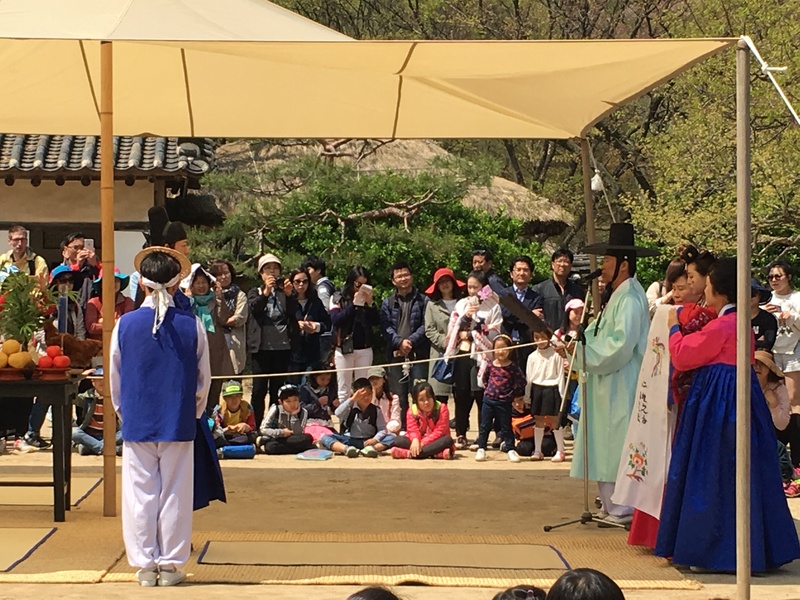 The last special presentation was a demonstration of a traditional Korean Marriage Ceremony. 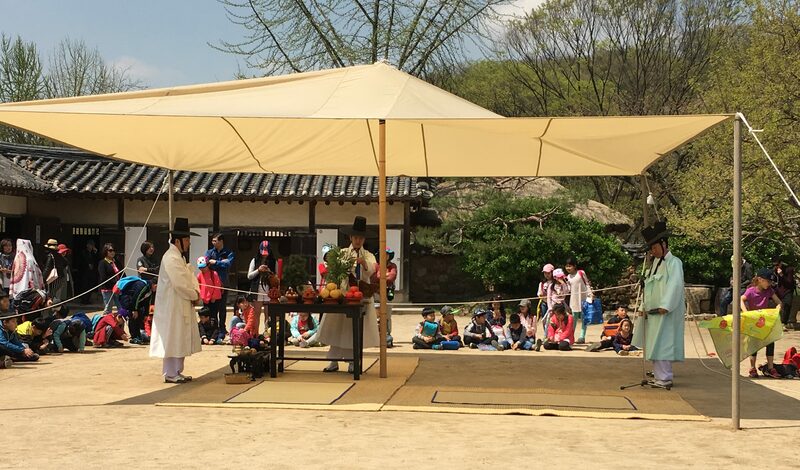 Marriage ceremonies were usually held under a tent like this one in the yard or home of the bride. Under the matrimonial tent the groom and bride are presented to each other. Love the back of the brides marriage costume. The groom kneels in front of his bride. 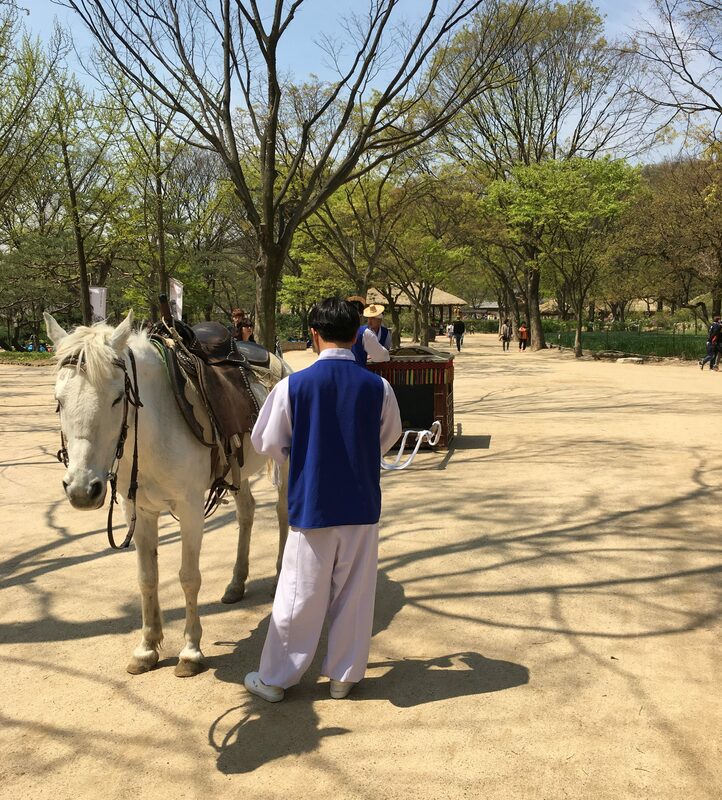 Following the ceremony, the groom rides his horse and his new bride is carried in a palanguin (chair) to his parent’s house where they will make their home. 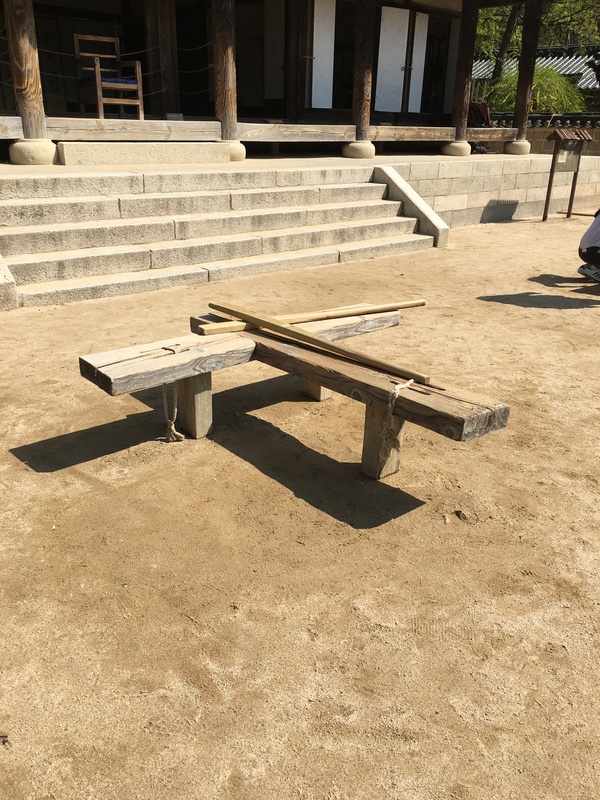 Our next stop was lunch….on the way to the “food court”, I saw this….just a little reminder that you are not really living hundreds of years ago. 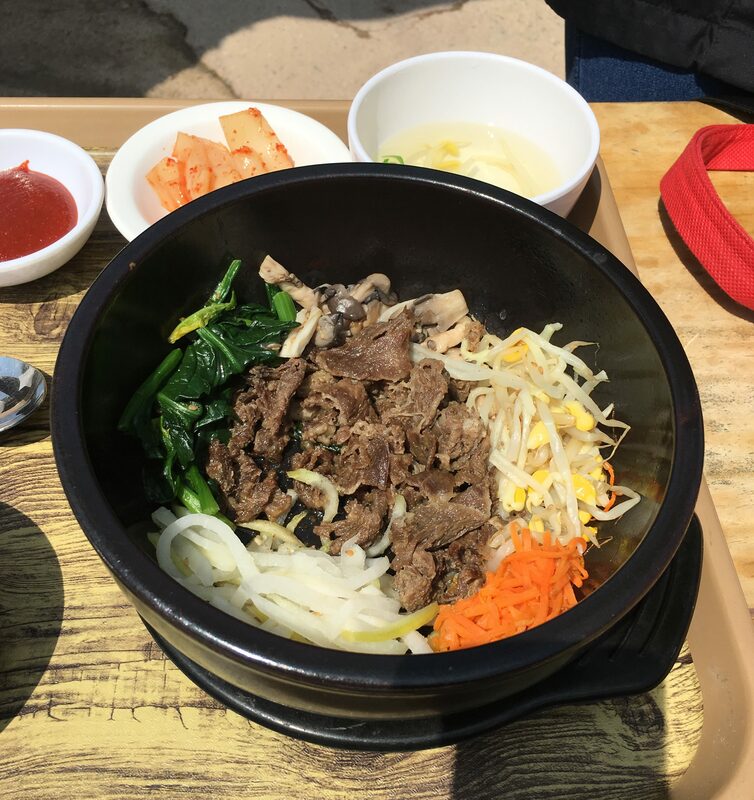 This is bibiimbab, a traditional Korean dish of beef, rice and vegetables. Time to sit back and relax for a bit….. Remember earlier I told you that I was picture happy? And that I tend to overshare? Well true to my word, I’m still sorting through the 327 pictures I took that day and having a hard time deciding what to leave out…..so I’ll be posting a “Part 2” soon with more pictures….